The prominent event in many a Sydneysider’s calendar at this time of year is the Royal Easter Show, which brings local and regional livestock, produce and entertainment to the city for a few weeks. In 2019, there’s a better reason than ever to visit, and that’s thanks to the creation of a unique beer brewed exclusively for the show, Show Stopper. Made with freshly-harvested Cascade hops from small NSW grower Ryefield Hops, malt sourced from Voyager Craft Malt, and brewed by Modus Operandi, the beer is a truly local affair. 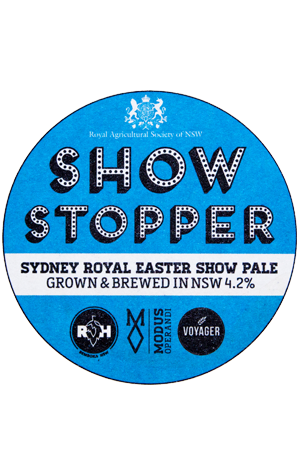 It’s the brainchild of Kate Saba, services manager for the Royal Agricultural Society of NSW, who wanted something a bit different from the usual commercial lagers to quench the thirst of the thousands of visitors that visit the show each year. This year is actually its second iteration, differing from the first predominantly by the malt suppliers; in 2018, that was sourced from award-winning show exhibitors. It’s crystal clear and pale gold in colour, with distinct fruit and citrus aromas and flavours. A hint of breadiness from the malt and a lingering hop bitterness add to the refreshing nature of the beer. Along with a low ABV, this makes it the ideal beer to enjoy after a long day in the sun, especially if that day has consisted of a diet of chips on a stick and Dagwood dogs.